Schwalbe’s Marathon Winter tyre is a specialist tyre with one purpose – keeping you upright and smiling when snow and ice are spilling other riders to the tarmac. Requiring considerable care to use on dry tarmac (heavy braking, trackstanding and any dragging of the bike sideways are likely to pull out studs), this is a tyre that needs nursing until the moment the bad weather hits – then you appreciate its true brilliance. At the time of writing, Chain Reaction have these on sale in the following sizes: Marathon Winter (20″), Marathon Winter (26″), Marathon Winter (700C). You can also get them for 25% off via Wiggle, 700c only. You know something’s working when you can pull a trailer up a slope coated in ice, or plough through snow like you’re on a mountain bike – and despite the studs and weight, roll respectably well on the good days. Unfortunately, even carbide studs will wear in mixed conditions, meaning this tyre may have a shorter lifetime than you might hope (potentially just one winter), although visual wear on the studs doesn’t necessarily seem to impact their performance. If you’re worrying about this too much, you’re probably not in the market for winter tyres in the first place! The Schwalbe Marathon Winter features thick sidewalls and a burly tread before you even consider the ~240 carbide studs clattering off the tarmac like overgrown rice crispies. For what it’s worth, the TPI count is a respectable 200 (three layers of 67tpi ply – for some reason Schwalbe don’t add up the layers as other manufacturers do). Pompetamine all-weather bike with 700x42mm Marathon Winter leading the way. It’s unquestionably slower than a slick road tyre (obviously!) and also slower than non-winterised Marathons. However, it is still faster than knobbly mountain bike tyres when you’ve blown them up fully, and the tyre is rolling on the central strip. Overall I was sufficiently satisfied with the performance of the 700C Marathon Winters that I kept mine on all winter (around three months) last year even though snowfall and ice was limited compared with the two previous, horrendous, winters. On snow and ice performance is excellent – so long as you’re sensible of anticipating corners and braking needs, you can get up a fair speed without worrying for your safety. When I swapped back to Kojaks it did feel like my bike had sprouted wings! My preferred combination of 42mm front and 35mm rear tyre meant that I was laughing at Edinburgh’s potholes road craters, kerbstones and so-called cobbles (aka regular pattern of gaping holes in the road) all winter long. That said, it would be a lie to suggest that the Marathon Winter is a comfortable tyre just because it’s fat… the rubber is thick and relatively dead-feeling, so I wouldn’t rush out to buy one for the great ride quality. It’s more that they are surprisingly useable-considering-what-they-are than comfortable in an absolute sense. First, the question everybody asks – I had no trouble at all with the studs causing a lack of grip on dry or wet tarmac. When the studs hit a surface they can’t penetrate, they just sink into the tread, leaving almost as much rubber as normal in contact with the ground. There’s no danger of the bike skating off the road on a slippery metal stud! Studs. Note at the centre a stud which came out after a few commutes – not yet rounded off. I did find an unexpected benefit that the bike was much better controlled on piles of decaying leaves on the railway paths – presumably because the studs pierce debris easily, and the stud/road traction is higher than rubber/wet leaves. It’s really unlikely that you’ll flat on a tyre as burly as the Marathon Winter, just because there’s so much material between your inner tube and the road. They also feature a Kevlar puncture strip for added reassurance. I didn’t have any issues at all with mine for the one winter I’ve ridden through central Edinburgh’s glassy routes – they don’t even seem to cut as easily as the rubber on my other tyres. If you have a dedicated winter bike or at least a spare pair of winter wheels, you should avoid riding on the Marathon Winter unless it’s actually wintery, because the studs don’t last when used on tarmac. Spare wheels aren’t really practical for me as I have a hub dynamo and a hub gear, and the bike is already my hack bike (I don’t commute on my nice bikes at all!). It’s not really an option to fit these tyres and remove them repeatedly on the hopes of an accurate weather forecast, so I fitted and ran them all winter in the knowledge that the wear would be high. Note difference made by ‘bedding in’ the studs! I suspect even rounded carbide digging into ice is going to be drastically better than normal tyre performance. However, the studs also seem to bed further and further into the tyre, further reducing their impact on slippy terrain and leaving me open to the possibility that wear will fatally compromise the performance of the tyre before it sees out a second winter. Now that it is the second winter, I want to update this to say that even with visually rounded studs, I’m still getting superb traction on sheet ice – enough to ride confidently through gentle turns, as you can see on the video in my recent studded tyre summary article. So, the jury’s out. It seems clear that I’ll get another 5-600 miles OK, but beyond that, who knows. One CCE member already has over 1,000km on a pair of Schwalbe studded tyres and reports they still grip like new. Don’t drag the back of the bike around, for instance to straighten it up before mounting, or put it away. I retrieved a few studs from the stairwell floor before figuring that out! You don’t need to be told this, but harsh riding will make you lose studs. Be smooth! Replacing studs is relatively straightforward with a screwdriver (or you could invest in a proper tool) – studs can be bought online for about £0.15p apiece). The tyres are expensive enough that I’d certainly look at getting a few replacement studs and fitting them as part of your routine bike maintenance. Replacing both centre lines of studs after a hard winter’s use would cost around £18 per tyre for parts, versus the RRP of £45 (street price £40? ), but you’d need to budget an evening’s frustrating labour and probably want to invest in the tool linked above. I’m not sure it would be economical by any reasonable costing of your own labour! 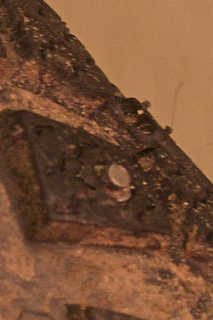 The possible but not-ideal way of replacing studs, with a screwdriver! Don’t go running to the bike shop when you discover a bunch of studs are missing, either – it’s almost certainly user error. As with rolling resistance – if you’re worrying about this, you might have the wrong idea! Not something you’d keep on for fun, but not insane either. Do you want to be able to ride with confidence in subzero conditions? If so, a pair of Marathon Winter tyres should really be in your future. … but then again, what do you want from a special-purpose tyre? You can ride on snow and ice without falling over. That comes with accepting the costs (so most people don’t use studded tyres). For me, with the severe winters in two of the last three years it was a no-brainer to fit these to my “maintenance free” town bike – even if I only get one more winter from them, that’s still a cost of £40 per annum, way less than getting the bus on wintery days. 2009-2010 and 2010-2011 saw me relegated to my mountain bike (and then have to completely replace the expensive drivetrain, not to mention getting soaked by the lack of proper mudguards). I’d much rather go down this path, even at £40 each, as I want to be able to ride with confidence 365 days a year. I have been winter commuting for about 30 years. I use cheap mountain bikes and am on my third one. I purchased Nokian Extreme tires about 12 years ago and have had great success with them. 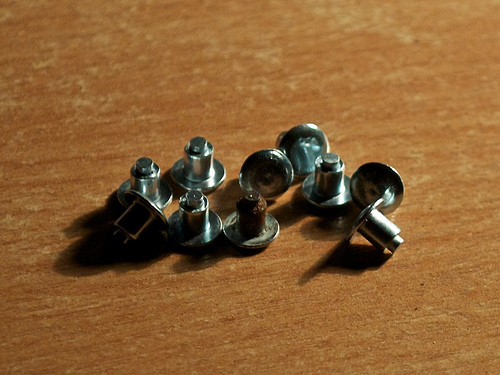 I have never lost a stud and although the studs are worn, they still work well. I recently bought a narrower model which I installed on the front wheel and I will continue to use the old tires on the back. Schalbe makes very high quality tires and I use them on my other bikes. After reading your review, I would recommend considering the Nokians over the Schwalbe for studded tires. I did consider the Nokian A10 as an alternative to the Marathon Winter. My commute is inner city taking in a couple of miles of unmaintained (but tarmacked) railway path, so I’m mainly worried about ice and a little snow, rather than anything extreme. The 240 studs of the Marathon Winter VS ~70 on the Nokian A10 was what swung it to Schwalbe for me, plus I really like the rest of the Schwalbe range. I’m not unhappy with them, because I can easily justify the cost. When you say you’ve ridden the Nokian Extreme for 12 years, I’m guessing you don’t mean every day? Do you fit them only when it’s snowy? I’d be very interested to know how your studs look and an estimate of mileage. Hi Dave. Very rough estimate of mileage is about 200 miles per season. My Nokian Extremes have 296 studs per tire. The two center rows are worn fairly smooth. The outside rows are still sharp and in good shape. I live in a small city in Iowa. They use alot of salt on the streets to melt the snow and ice. When the streets are dry, I ride my other commuting bike. Thanks. Alas we only have room for a limited number of bikes, and one commuter each is the limit – that means one “year” from me is three “years” for you, give or take. Still an impressive mileage. The outer studs on my tyres are still OK, so if I dropped the pressure as low as practical they would still grip well (but be horrendously slow) – I think I’ll update the main body of text above with a better wear detail shot. Being the lazy devil I am, mine go on in November and come off about March. They’re pretty much dead after two seasons – towards the end of last winter I got two flats from studs wearing through the tyre and nipping the inner tube. I’m going to try a layer of gaffa tape/spare tube around the rim to nurse them through one last season. Grip seemed to be ok even with the rounded studs, but as you say, last winter wasn’t anything like as bad as the one before! There’s a distressing topic on CCE “Icy Innocent Incident Indicates A&E” where it looks like an off on a cold day last winter may lead to a hip replacement (not for an oldie). Pretty terrible, and good motivation to fork out a few quid for spiky tyres. Thanks for posting your review Dave. I’m looking at these tyres again having taken a couple of bad spills during winter before last and simply stopping the bike commute last year once the frosts set in. It’s good to learn that replacement studs are now available, that’s one of the things that put me off making the investment previously. Dave, that’s a great review. I’m in the Borders and do a 12 mile each way all-rural commute. Like you I was motivated by the hard winters of 2008/09/10 to get spikey tyres or miss out on some great commutes on beautiful icy frosty/mornings. I bought the Marathon Winters in 26″ x 1.75″, running them on a lightweight rigid-forked MTB with proper SKS guards. I’m fortunate to have a dedicated ice bike ready to go on subzero days (I also have 26″ wheels with 25c slicks for the same bike as a back up/alternative winter commuter). My usual commuter is a full-guard winter training road bike for all days but icy ones, so my spikey tyres have had little use since I got them just over a year ago (given the mild last winter) but when I’ve used them, boy, what a great experience! We get some pretty hard frost out here in the sticks and early winter mornings often have skating-rink areas where the field run-off over the roads have frozen solid, as well as plenty of black ice. The Winters are superb in this sort of situation. Interesting stuff on wear rates although I’d imagine that because of the soft tread blocks, even well-bedded and rounded studs would work quite well for an extended period. Schwalbe will send you a free handful if you drop them a line, to save a bit of cost. My stud loss was similar to yours. My ideal would be one of those very cold days where the hard-packed snow of previous days has made my commuting route just about passable by 4×4. My whole commute was like this in the previous hard winters, when I didn’t have the Winters, so I’m hoping for a few days like this at least – the novelty factor of being able to ride fairly normally (I agree with the softly softly approach) in such extreme conditions is extremely addictive! Doing it in pitch dark adds to the excitement! For more info on these tyres there’s a thread on BikeRadar started by me (“BordersRoadie”) which discusses stud loss and loads more – do a forum search and you’ll easily find it. I’ll post a link to your excellent review on the thread. Thanks for the thoughtful comment. I’m certainly hoping for some hard winter action this year – nothing beats flying past queues of stuffed drivers (and buses!) and the odd spill does keep you humble. I want to make a snow plough adapter for my Carry Freedom trailer (what else is left to do?) so it had better get some action! I ride two different bikes with studded tires in the winter. One is an older Bianchi Volpe on which I’ve mounted Nokian 700×35 A10 and the other is a mountain bike that sports a Nokian W106 on the rear and a Mount & Ground on the front. I ride the MTB when it’s actually going to snow and the Bianchi the rest of the time, when I feel studded tires are needed. I live in northern Vermont (USA) and commute 38 miles round trip, with 7 to 10 miles of that on dirt roads. They take plowing seriously up here, but it snows a lot, too, so riding home in a snow storm is something I’ve done a number of times. I am starting my fourth season on the A10s and have racked up 2,350 miles on them thus far. The rear has a little more wear than the front, with a 2mm vs 2.5mm tread depth right now, but they don’t seem to have lost any traction. I have never lost a stud in any of these four tires. I do notice that the studs have rounded ends now, but it doesn’t seem to reduce traction at all. 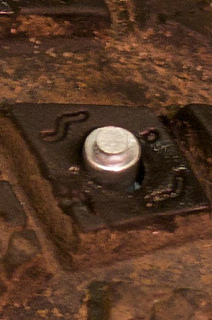 The stud is intended to bite into ice, and it doesn’t need sharp edges to do that. I have noticed some elongation of the hole around each stud on the A10s. This is pretty much in a lateral direction and, with the placement of the studs on the A10, combined with the tread profile, this is not surprising. I’m a cautious rider, but I also ride as fast as I can (which on studded tires is not fast at all! The A10s drop my average speed 2-3 mph). I don’t like to fall, and I’ve only gone down a couple times on studded tires, usually when the back tire has spun, whipping the bike around. I don’t know any reason why you should be losing so many studs. The studs in the photo have generous mushrooms, so I suspect that it’s the shallow tread depth of the Marathon Winters that is to blame. I feel like crying sometimes when, like this morning, I’m plodding along on these heavy tires, fighting a stiff headwind, and with the hub dyno adding insult to injury, until I remind myself that it’s still better than driving. I think I’ll stick with the Nokians, though. Thanks for the comment. I’m definitely interested in trying a set of Nokians, perhaps if we kit out our MTBs for winter action this year. Lots of people do seem to lose studs on the Marathon Winter, although I guess it’s a combination of lots of riding on dry tarmac, slow speed (dry steering) and dragging the bike sideways in my case, i.e. user error. I just tryed the marathon winter tire 700c*35 on the “Mont Royal” (Montréal). It was dramatic icy condition. On clean ice and snow it works like a charm I was amazed how confident it feels. On a rutted icy road it was an another game. I was still able to bike but with much care. I will bike on it during winter I let you know about its life thread. Im thinking about getting a Pompetamine. I´m from Norway, and need some solid studded tyres. 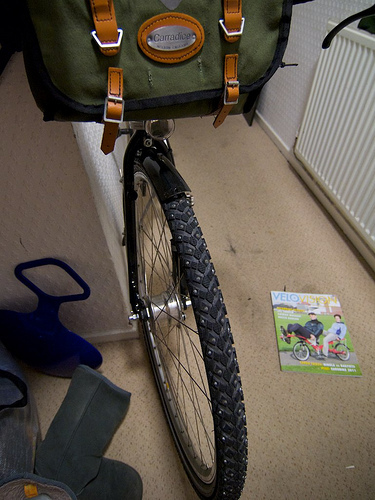 Was it really posssible to fit that bike with 700x42c tyres + mudguards? I contaced On-One, but they told me it would be hard to wear larger tyres than 700x35c. I have the narrower 700×35 Marathon Winter on the back of the bike, and the 700×42 on the front. However, the fork is from Cotic (link) not from On-One. The matching fork might have a smaller clearance. So 700x35c would be the largest possible option at the back (and front with original fork)? How much hazzle would it be to change the fork? I bought just the frame so it was a question of buying a different fork instead, no cost or hassle. If you are buying a complete bike, it means spending the extra for the fork, and finding a bike shop to swap the crown race and star nut (at least). Once these are transferred to the new fork, it’s easy to reassemble with just an allen key. Agree with this review, they sure do give you confidence when it’s icy. Mine are on for the their second winter outing and I just got my first puncture caused by the pins pushing through slightly and nicking the inner. That’s about 1,500 miles. Rubber on the outside and studs still look good. It was the back one and I am heavy with full panniers. I’m going to try and bung a worn out slick racing foldable tyre with the beading removed in there. only discovered your site today. Great! I’ve used marathon winter tires on my bikes over the last couple of years, so has my wife. I have tires in 40-406, 47-559 on my bikes my wife uses 37-622 ones. She lost a couple of studs on her rear wheel. I didn’t, although I ride more and more aggressively. However: If the icy conditions would be more constant/predictable, I would go for both tires spiked. Same would apply to longer rides – my commute is 10 km round trip and I can live with less speed due to slipping-rear-tire-danger on some days. 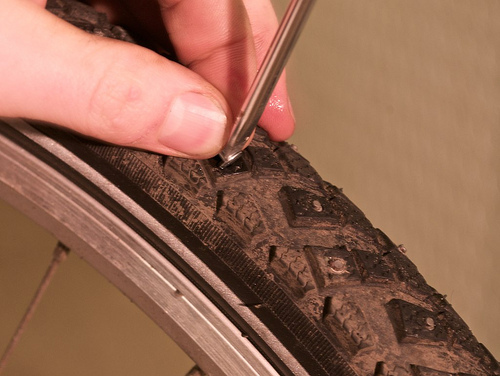 Found your site by googling winter tyres for bikes – particularly liked the video! I commute across Glasgow by road on a hybrid and as you will know in the Scottish climate ice is the problem rather than snow. I fell off last winter in traffic and it was not very pleasant. I had thought about putting winter tyres on my MTB for icy commutes, but reading your article it sounds like I can put them on the hybrid and use it whether it icy or not and change back in the spring. This could, however mean that I am running on them more often on non-icy roads than icy roads. Does this affect durability / stud loss? Running the tyres in seems to be an issue too? I mainly run mine on non-icy roads too, since I’m too lazy and/or tight to have two complete sets of wheels (especially hub gear & drum brake dynamo…) to swap them on bad days. Also, invariably you will find the days when you really want them are the days you decided not to bother, whereas if you just have them on all the time you’re never caught short. How long is your commute? I reckon you can expect to get a full winter at 100 miles a week on dry roads from these tyres no bother, but much beyond that and I think you’d start to notice the studs rounding off (although they still grip much better than rubber even when they’re very rounded off – I guess because they’re still projecting and still really hard). My best advice on avoiding stud loss is to be gentle initially, don’t trackstand or dry-steer the bike, and don’t drag it from side to side when you put it away at either end, as it’s quite easy then to scrape off a stud. I’m just considering when to fit mine for the start of their third winter (front tyre) with a new tyre for the rear. I have just put a 42*622 winter marathon on my back wheel, I have an old nokian in the front. Testing conditions were far moore excellent than I prefer, first about 16km on either ice covered roads, or ice covered with gravel (worst winter ever in Luleå, the very north of Sweden, about 150 km south of the polar circle), partly on bicycle road, and partly on highway. Than I went out on the sea, wich was covered with excellent skating ice (normally it´s half a meter snow on it). The friend I visited lives on an island, and I biked on the ice for at least 2,75 km, and the sun had already set, but it was still some light left. The tires were really good, though I was quite carefull. A couple of hours later I went home again, and than it was pitch black, though they had lights on the harbor where the road start so I had no problems finding the way. Pretty scary though when the changeing levels of water makes the at least 24 cm thick ice crack, sounds like a gun shot:) I will soon buy a couple of 35-622 winter marathon on my touring bike wich I used, and put the ones I used today on my commuting bike. I´ve found out that I don´t need a winter tyre with moore coarse tread as the snow removal is excellent here. I commute 5+5 km every day, and I also do longer trips in the winter, so I´ll be back with moore comments later when I get the new set. Put Marathons on last winter and kept them on for a few months. Thought they were great – slow, noisy, but secure! Of course there were only a couple of days of frost – typical. Lost a few studs in the back so just have ordered Schwalbe replacements with a tool from Bike24 in Germany to prepare for the frost. 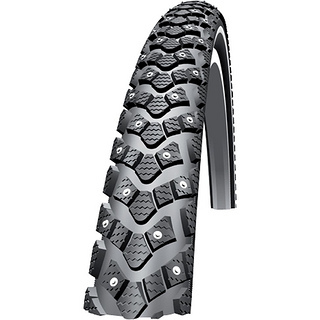 Tempted to put them on my mountain bike for this winter for emergencies only and keep my commuting hybrid on normal tyres, unless we get a real cold spell, which will mean a further changeover. Who knows? Thanks for the excellent review, I’m now looking forward to leaving the car at home this winter and commuting all year round. I like the idea of varying the pressure to suit conditions, it means I won’t get caught out with the wrong tyres but can speed cautiously along once the sun has done it’s work, hopefully. Bought then for xmas and have had them on since jan 5th and cycled most days. Wednesday cycled to work snowy ice conditions and even on untreated roads. JUst did a full week of commuting and cycled home tonight. It felt cold but didnt have any issues until I tried to walk to supermarket after parking the bike up. I’ve been a winter rider for 20+ years, i just enjoy it. Getting these tires for the first time just this year was a total face palm moment where it’s one of those things you should have done a long time ago. As an experiment, (and the store only had 1 narrow tire) i bought one tire for my winter bike and put it on the front just as we got our first snow and ice-up. I was so blown away by the traction and improved control that i ran out the next weekend and bought one for the rear. …it’s unbelievable, you roll straight even on lumpy hard shiny ice (no more side to side sliding down the lumps and ruts), and handling on flat hard glare ice is nearly as good as on a dry road. 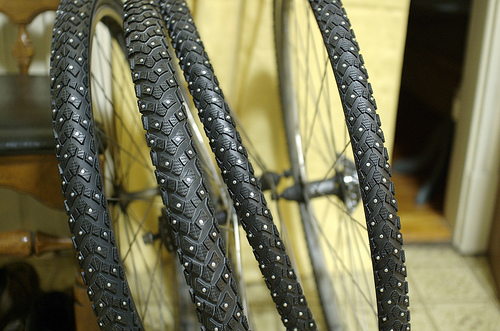 If you ride in the winter, get studded tires. I realize this articles is several years old now but I’ll chime in with my Nokian M&G 160. I’ve been using the same tires for over a decade now for lower Michigan winters. I commute 20miles a day during the winter. I run them from Nov./Dec. until the weather clears up around March. I’ve never lost a stud. For anyone looking for Nokians now, they closed down their bicycle production and sold it to Suomi. Fortunately Suimo has kept the naming scheme. I hope they get back into QBP and we’ll start seeing them in the US again.